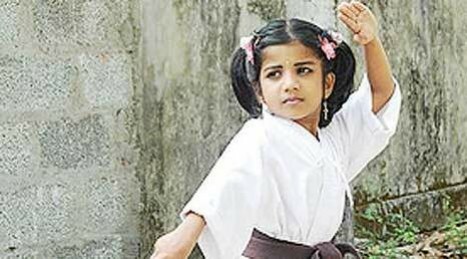 Seven -year-old girl Varsha Vinod, hailing from Ambalappuzha in Alappuzha, hogged the limelight when she became the world's youngest black belt in 2009. Now she has secured another world record as the first 'dan' black belt (1st degree in Karate) after a test conducted by sensei Vinod, sensei Neel Moses, sensei Suraj and sensei Ajith. The girl received her official title from additional DGP P Chandrasekhar in front of a huge gathering here on Sunday. Varsha Vinod is a trainee at the Ko-In-Chi Academy in Alappuzha, functioning under the World Martial Arts Federation, USA. She is an expert in risky and dangerous manoeuvres, like the 'nunchak,' performed only by senior black belt holders. She is skilled at 'kangudai', an item in the 'katha' category and can easily do about 15 types of 'kathas'. Normally, karate black belt is given after six years of training. However, Varsha got the black belt at the age of five, thanks to her extra-ordinary skills. Varsha is a third-stand student at Maria Montessori Central School at Ambalappuzha in Alappuzha.